A house full of possessed furniture is enough to drive most people crazy, but not Mrs. Margaret Hatchet. In Minutes to Mayhem, four players control ghosts trying to freak out Mags, but the fifth player controls Mrs Hatchet herself — and she’s got an axe. 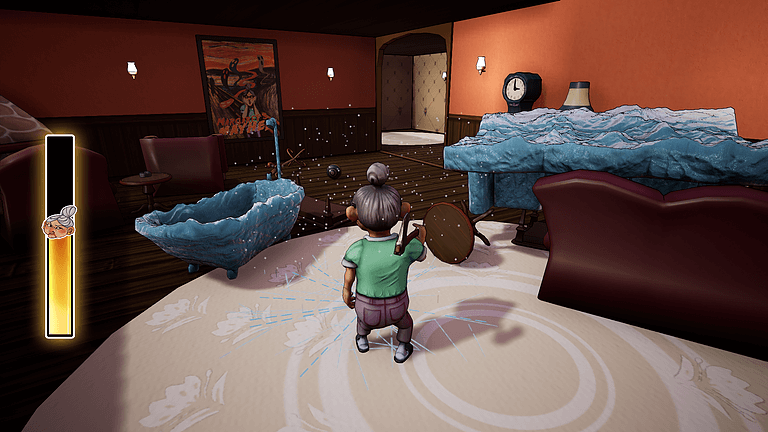 Minutes to Mayhem, from Kraken Games, is a four-versus-one asymmetrical multiplayer game where four ghosts must terrify a rather unfeeble old lady. The ghost characters can possess most of the objects within the house, which they can then move around at will, with their speed, ease of maneuverability and friction denoted by the object. These ghost characters can win through stealth, offense or a mix of both. The other player, Mrs Hatchet, wins by defeating the four ghosts before she is overwhelmed. While she might have a lot of fight in her, too many hits, or the ghosts simply being too close to her for too long, will cause her stress to increase until she collapses to the ground. This results in a feeling of both impatience and caution in the ghost characters; they need to work as a team to keep their proximity to the old lady, but do so while being as innocent-looking as possible. They can also charge up furniture and dash it into the lady, knocking her from her feet. 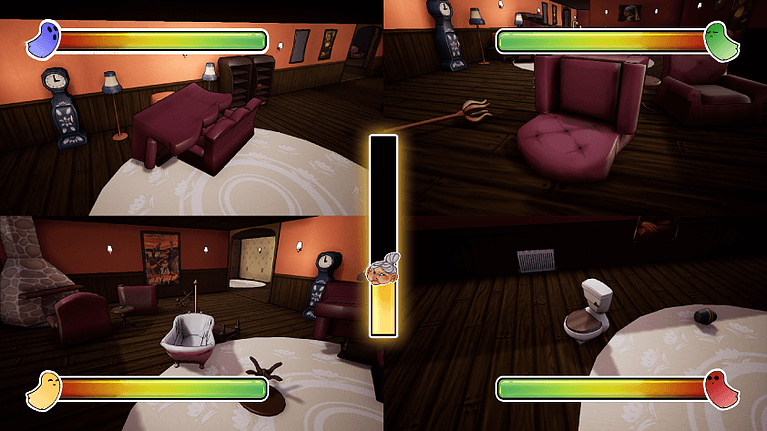 Do the team use smaller, more nimble pieces of furniture to kite the other player through the house before another player throws a heavier object straight into the old lady? An oven or dresser would certainly do enough damage to turn the tables. But, as easy as those plans are to formulate, the execution is harder… and she has an axe. I was lucky enough to play a few rounds of Minutes to Mayhem while at the Sweden Games Conference late last year. To say that the abilities of the two teams are well balanced would be an understatement; it very much came down to tiny failings in the plans of the ghosts for the power to shift between the teams. Minutes of Mayhem is, as with Kraken’s previous game Yo, Bartender, unlikely to manifest itself outside of events — which is a crying shame. You can follow Kraken via their Facebook page.